In the last episode of this blog series we learned about the overall concepts of input methods in Qt, with a look behind the scenes to see how a key press event from the native windowing system travels through the Qt input stack until it appears on screen inside a QLineEdit. In that context, the input method was used to allow the user to modify the input (e.g. composing a Chinese character sequence from Latin1 input). Today we want to shed some light on another use case of the input method system, namely how to implement an out-of-process virtual keyboard that can be used to feed text input to arbitrary Qt-based applications. Why do we need a virtual keyboard? Believe it or not, there are devices out there which do not have a hardware keyboard attached (you might be holding one in your hand right now, while reading these lines ;)): mobile phones, tablets, kiosk terminals, to name just a few of them. The virtual keyboard (or sometimes called on-screen keyboard), is an application that runs alongside the other applications on the device. Whenever the user wants to input some text for the other applications, the virtual keyboard pops up a window that imitates the keys of a hardware keyboard. The user can now click the key buttons and the virtual keyboard application will convert those to key events, which will be sent to the application window that currently has the input focus. The receiving application processes the events like normal key events, so whether a hardware keyboard or a virtual keyboard is used should be opaque to it. How do we implement a virtual keyboard with Qt? There are actually two ways to implement a virtual keyboard with Qt: in-process and out-of-process. For the in-process approach, the virtual keyboard becomes just another QWidget or QtQuick Item that shows the keyboard buttons, reacts to user interaction and delivers the synthesized QKeyEvents to the application’s event loop. The advantage of this approach is that it is very easy to implement, since no inter-process communication between the keyboard and the application is needed. The disadvantage, however, is that every application has to store its own instance of the virtual keyboard and the state of all these instances (visibility, activity etc.) might somehow need to be synchronized between applications. The out-of-process approach, on the other hand, allows for a single instance of the virtual keyboard to be shared between all other applications, so no synchronization between multiple virtual keyboard instances is necessary. This requires you to come up with an inter-process communication mechanism between the global virtual keyboard instance and all the applications that want to use it. In today’s blog post, we’ll go for the out-of-process approach and use DBus as the IPC mechanism, since it requires little code to integrate it with Qt applications and has already proved to work for other input method systems (IBus). Our keyboard application is based on Qt Widgets, to minimise the amount of code to write, but the concepts can be adopted to a QtQuick based UI wholesale. The actual UI is really basic, just a QGridLayout with a couple of buttons inside. There is one button for each number, one for each Latin character and a Backspace and Enter button. For simplicity we omit Shift and CapsLock keys (and therefore the functionality of entering upper case characters), implementing that is left as an exercise for the reader ;). Our Keyboard class inherits from QWidget, so that it can be shown as a window on the screen. Except from a constructor, where all the UI initialization is done, it provides three public slots to show up the keyboard UI, hide it again and query its current visibility. Additionally there are two signals keyClicked() and specialKeyClicked(), which are emitted whenever the user clicked a number or letter button (keyClicked()) or the Backspace or Enter button (specialKeyClicked()). So every entry has the Qt::Key code and the label that should be used. Additionally there are some special marker entries with key code ‘NEXT_ROW_MARKER’, which just ensure that the following buttons will end up on the next line in our QGridLayout. In this simple keyboard implementation, we just return the label of the button (so a lower-case character or a number). In a more advanced version, you would have to take pressed modifier keys into consideration to map to upper-case or other special characters. The implementation for the remaining public slots is straightforward. They simply forward the requests to the corresponding methods in the QWidget base class. To summarize: We now have a keyboard UI application that is accessible via DBus through the name “com.kdab.inputmethod/VirtualKeyboard”. It provides methods to show it on screen, hide it from screen and ask for its current visibility. Additionally, that application emits the two signals specialKeyClicked() and keyClicked() (also via DBus) whenever the user clicks on one of the QPushButtons. 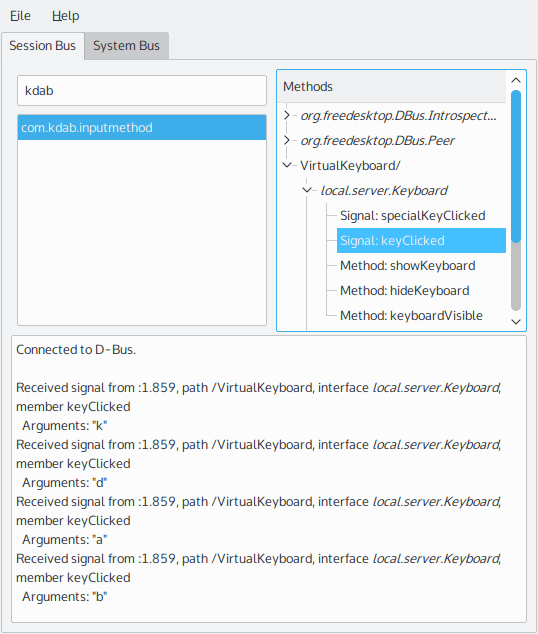 A simple test as to whether the keyboard UI works as expected, can be done by starting the application and then using qdbusviewer to inspect its DBus interface, invoke the exported slots and log the signal emissions. The term ‘vkim’ is short for ‘virtual keyboard input method’ and is used as an identifier for our input method plugin. We will see later on where it is needed. Additionally there are the two private slots, keyboardSpecialKeyClicked() and keyboardKeyClicked(), which are invoked whenever we receive the corresponding signals from our keyboard UI application via DBus. The two member variables store a pointer to the DBus interface and a pointer to the current focus object in the application. Inside the constructor, the connection to the keyboard UI DBus interface is established. Here we have to specify the “com.kdab.inputmethod” application ID and “/VirtualKeyboard” path to point to the exported Keyboard object. Since our class needs to be informed about the buttons that the user clicked on the keyboard UI, we connect the two signals keyClicked() and specialKeyClicked() against the two private slots. Inside the isValid() method we just return whether the DBus interface object is valid. If we couldn’t connect to the keyboard UI application, then our input method wouldn’t be of any use, so this test is sufficient. In case the QGuiApplication informs us about a new focus object, we store the pointer to it in the member variable, since we need it later on (see below). Now we come to the part where our custom QPlatformInputContext forwards the key clicks, as received from the keyboard UI application, to the user application. For textual input that is done with the QInputMethodEvent. So if there is a text input widget that currently has the input focus (m_focusObject != null) we set the typed in characters as commit string on the event and send it to the object. Since we are passing values unequal to 0 to the second and third parameter of setCommitString(), the QInputEvent won’t append the given characters to the content of the input widget, but will replace 1 character (replaceLength in 3rd parameter) at position -1 (replaceFrom in 2nd parameter), which means 1 character left of the input cursor position, with an empty string (first parameter). Now that we have the virtual keyboard and the input method plugin that communicates with it, let’s have a look at how to use it with a real Qt application. By default, the used QPA plugin provides an input method for the system, so if we want to use our own one, we have to tell Qt about that explicitly, by setting the environment variable QT_IM_MODULE to the identifier of the input method. In our case that identifier is ‘vkim’, the very same value we stored inside vkim.json as meta data for the input method plugin. positioning of keyboard window In the current implementation, the position of the keyboard window on screen is selected by the window manager, which normally prevents windows from overlapping. For the virtual keyboard, however, we might want to open it near (below or above) the text input widget, so that we don’t have to move the mouse cursor across the whole screen. With QWidget::mapToGlobal() we can determine the position of the focus widget on the screen and place the UI accordingly, by adding a new ‘void setPosition(int x, int y)’ method to the DBus interface of the Keyboard class. The source code of the example can be found at https://github.com/KDAB/virtual-keyboard-demo. yes, the linked code is supposed to be compiled with Qt5. Is your IM module installed in the right path? Have a look at http://doc.qt.io/qt-5/deployment-plugins.html#debugging-plugins for further ideas how to debug plugin loading (e.g. QT_DEBUG_PLUGINS), that should give you a hint if the plugin can be found/loaded at all. Hi Tobias (sprichst Du Deutsch ?). you have been right, the code didn’t work with latest Qt 5.5, because the IID for the plugin meta data has changed from “org.qt-project.Qt.QPlatformInputContextFactoryInterface” to “org.qt-project.Qt.QPlatformInputContextFactoryInterface.5.1”. I have fixed the code in the repository now, instead of hard-coding the string literal, it uses the QPlatformInputContextFactoryInterface_iid define now. I am very happy, because now is working. This will give me hope to make working also “gcin” input method, which we always use. Very much thanks for your help. Thanks for the interesting article. I am in the process of converting a Qt4 application to run on Qt5 and now have everything working except the On-Screen-Keyboard. As our software runs on proprietary devices and is the only running application that has any user interaction via the screen, I am interested in the in-process approach which you say in your introduction “… is very easy to implement”. I’m struggling to find documentation anywhere on how to do this and wondered if you could point me at any or explain how your implementation would be adapted? I already have the OSK from my Qt4 app so just being able to hook it up would be really good – especially as I was given 1 day to do the whole migration and I’ve already taken 2 (which, all things considered is not too bad considering it has over 400,000 lines of code) 🙂 The OSK is now the only stumbling block. Thanks again. the in-process OSK can be implemented by just creating corresponding QKeyEvent objects, whenever the user presses/releases on one of the OSK button, and deliver them to the current focus object of the application, e.g. QGuiApplication::sendEvent(QGuiApplication::focusObject(), event). You just have to make sure that clicking the button on the OSK won’t let it take the focus (see how it is done on the external OSK in the example in the git repo). Thanks Tobias – I hope you won’t mind if I ask one more question: In my Qt4 application, after instantiating my own class which inherited from QInputContext all I had to do was call qApp->setInputContext and this ensured that when I touched a UI input element my OSK would pop-up. Is there something similar I can do in Qt5 with my QPlatformInputContext derived class or do I need to hook all of that up manually too? the QGuiApplication::setInputContext() method has been removed in Qt5. To use a custom input method, you have to implement and install your own input method plugin and make the application using it by setting the QT_IM_MODULE environment variable. Is there any way you can show how to do the virtual keyboard by doing the in process approach? I am confused how it would be different than the out of process approach. for the in-process version, you’d simply put the virtual keyboard widget into the main application and let it communicate directly with the QVkImPlatformInputContext, so the separate server process and dbus communication is left out. It’s very valuable information for me. However I have an issue to build ‘plugin’ project. “Project ERROR: Could not find feature reduce_exports”. From some forums in the internet, I now know it was caused by “load(qt_plugin)”, but I don’t know how to fix it. I just pushed a fix to the git repository, which fixes compilation with Qt 5.8, please re-pull. BTW, I think there is a description about this kind of tricky issue. I’m reading http://doc.qt.io/qt-5/plugins-howto.html and related, but I can’t find it. If I’m right, where could I find such document? the error message says it all: ‘Unable to register at DBus’, so your system seems to miss a running DBus daemon where the virtual keyboard could connect to. Thanks so much for a very informative post. I was able to make it work “in-process” by putting the keyboard class in the plug-in and it’s been working so far. Is there any problem with instantiating widgets in a plug-in? instantiating a widget from a plug-in is perfectly fine (that’s how QtCreator creates most of its UI for example), just make sure that do you not unload the plugin as long a such a widget instance is still around. To get the server to build on Debian Stretch I had to install `qtbase5-private-dev`.